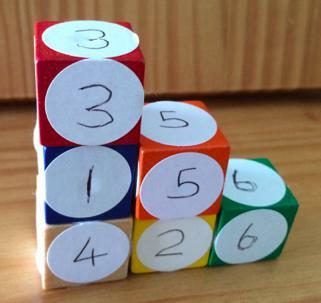 You'll need a set of six same sized cubes and some labels to number them 1 to 6. They'll be joined face to face as these two examples show. The main thing to try is to add up the numbers that are visible as you walk around the staircase without moving any of the cubes. This staircase above gives a total of 78 - do you agree? How did you count? The exploration may begin with finding the staircase arrngement that would give the highest number and then the lowest number. You could then try other shapes like the two at the top, each time searching for the highest and then the lowest. What arrangement of what shape gives the highest/lowest possible? You can extend the exploration by changing one of the rules and investigating further. Probably best to read through a couple of times considering what each sentence means and if you are still stuck then reply to this with a question. She sent in a lengthy pdf that is worth while looking at and it's published at https://nrich.maths.org/10918?part=solution.